If you’ve ever wanted to get married or renew your vows on the most romantic day of the year, you will now have your chance. 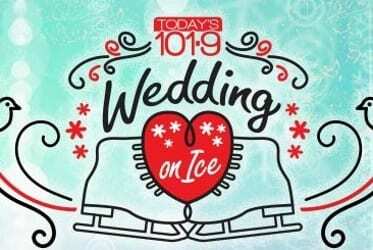 Today’s 101.9 FM will be holding a Valentine’s Day Wedding On Ice event on The Avenue at White Marsh on Wednesday, February 14th. The event will feature a “mass wedding” on the ice. Participation is free. Your only expense will be for your marriage license. There will be music, a wedding cake, a photographer, and a videographer. Participants are free to invite their friends and family members to come share in the special moment.